Thank you guys so much for all your comments and support on yesterday’s post! It seems like a lot of you can relate to feeling like you barely know your old self anymore. When you lose a significant amount of weight and/or make drastic changes to move towards a healthy lifestyle, a lot more changes than just the way you look to others. For those of you just starting or thinking about starting on your journey, realize that it’s much more important to focus on the day at hand and making smart, healthy decisions for yourself right now, rather than looking too far ahead and getting discouraged. I promise you that those little choices you make will eventually add up to huge strides in your own healthiness journey and before long, you’ll have a similar story to share. Moving along – though I desperately miss the perfection that is San Diego, I have to admit it does feel pretty good to get back into my normal routine and be sleeping in my own bed (though the beds at the Westin ARE heavenly). Because of the severe weather alerts that actually did come true, I got let out of work at 3pm yesterday in hopes of beating the storm home. While I did get home before the storm, I immediately went out to the grocery store to pick up a few things. I could have made due with frozen veggies, grains, and the tofu and tempeh in my fridge, but I really wanted to get some fresh fruit and veggies and stock up the kitchen. So I did. And the drive was kind of intense with slush/snow, but the supermarket was shockingly not busy at all and I was able to zip around the store and be done in less than 30 minutes. Luckily, too, because as I was pulling back into my garage afterwards, the weather was getting worse and worse and let’s just say I was glad not to be driving anymore. After the grocery store, I ended up doing a 35 minute tempo run, and it felt wonderful. I was trying to figure out why I felt so good during the run, and I’m pretty sure I was experiencing runners high, for the second time ever. It’s crazy how runs can be so hit or miss, and this one just felt so good that I was almost disappointed when it was over. 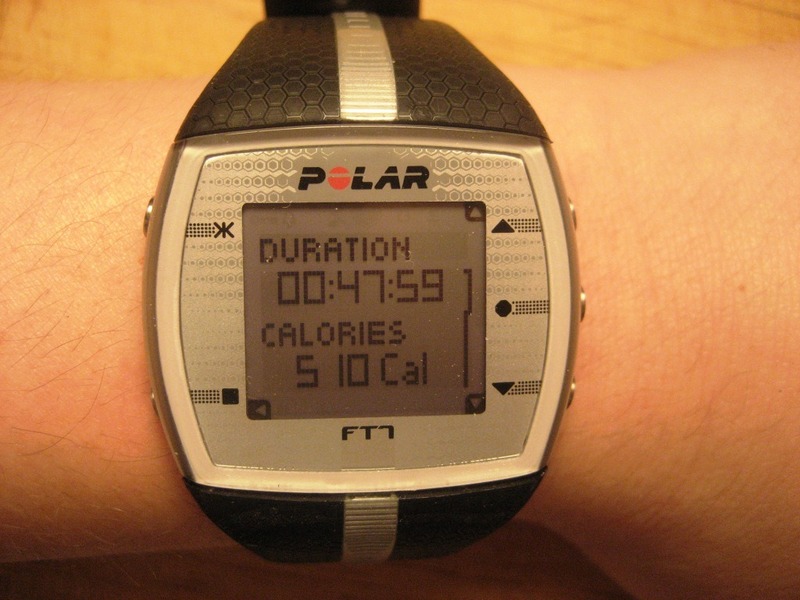 Man I love my Polar. I honestly don’t know if I can go back to the Garmin, even when I start running outside again… You’d be proud of me though – I stretched for 8 minutes after my run. I think that’s a record for me. After a quick shower, I whipped up a quick and healthy dinner with Wil, and it felt so good to be back in my own kitchen. 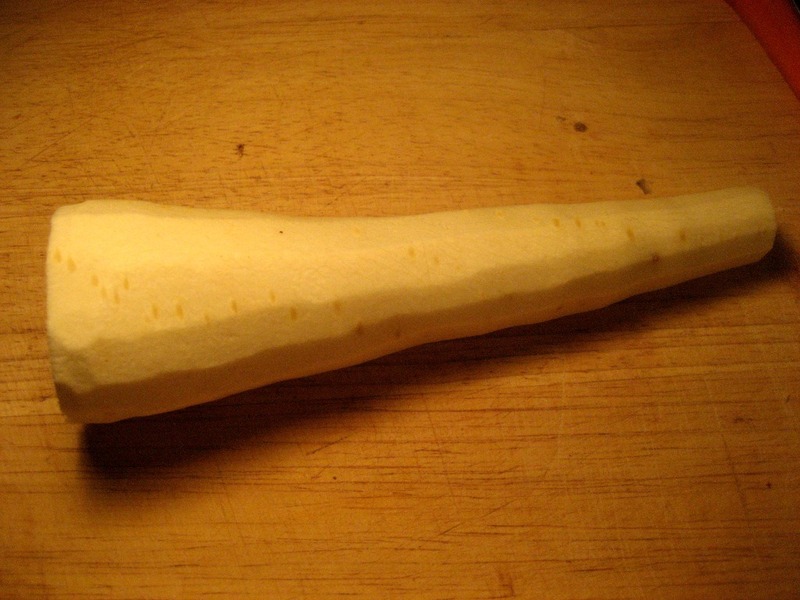 I picked up a few parsnips at the store, and I just love them. This might be obvious to some, but I only learned it within the last several months. 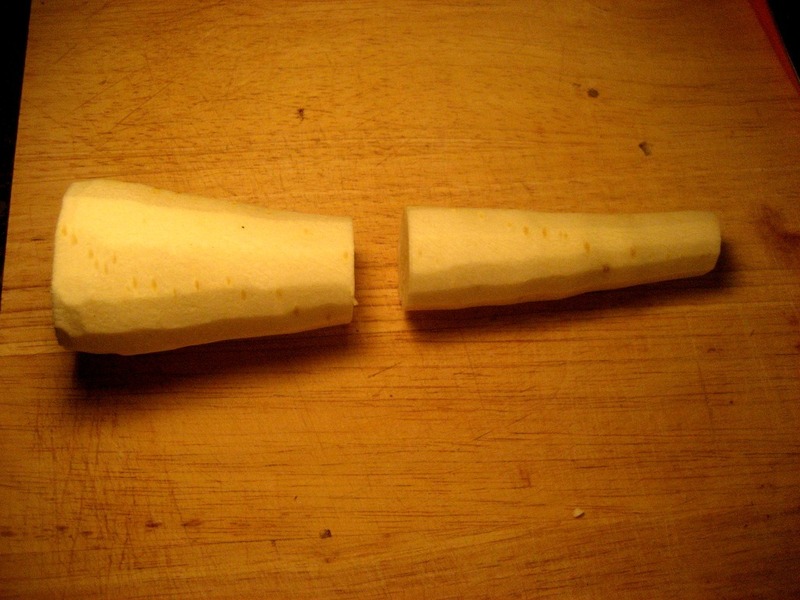 If you cut a parsnip in half before you start chopping it, it makes it way easier to handle. Same story with carrots. 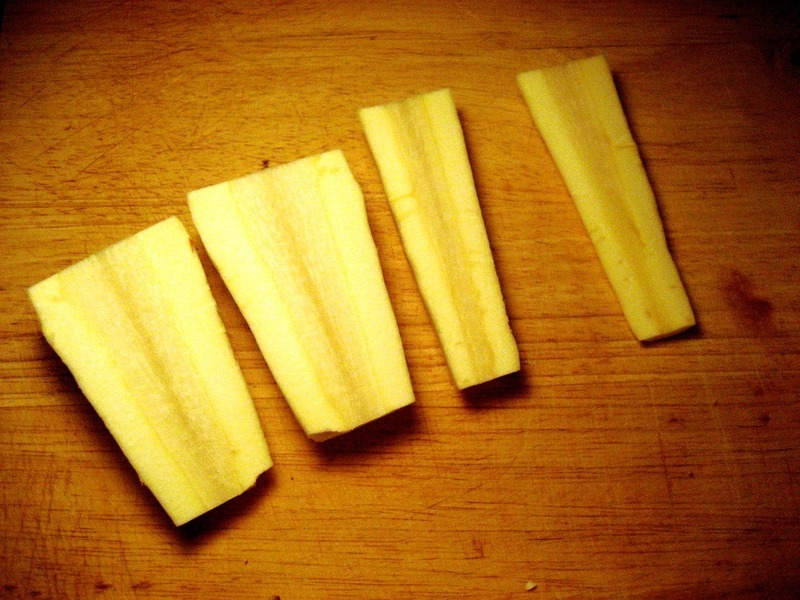 You slice those ones in half again, and then chop them to your desired size, trying to get them all about the same. I used to always try to cut them in half lengthwise while they were still intact, and they would always come out so uneven. Doing them this way helps a lot. 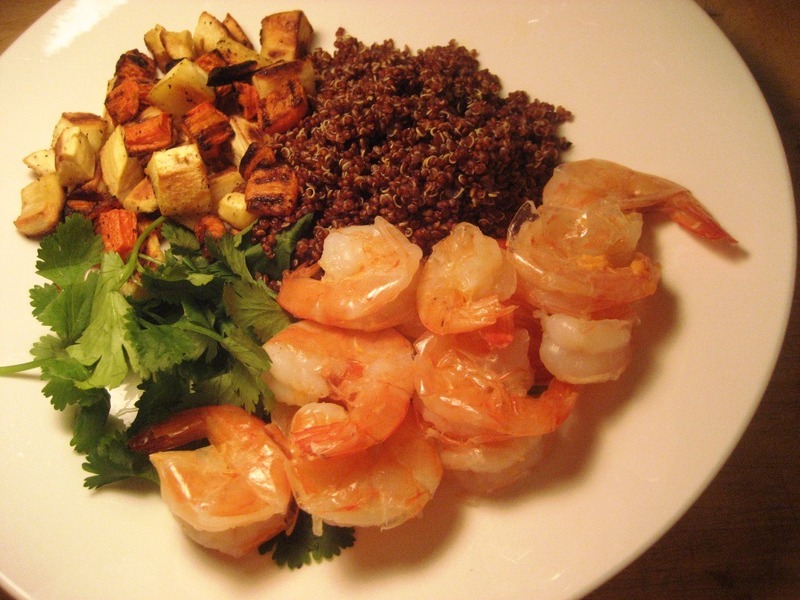 Anyways, I ended up roasting two large parsnips and four carrots in a little evoo, salt, and pepper, making some red quinoa (1/2 cup dried, rinsed, added to 1 cup of water, boiled, then brought to a simmer until the water was all gone – about 15 minutes total), and steaming just under a pound of shrimp for Wil and I for dinner (plus lunch for me today). What’s the thing you miss most about being home after you’ve been away (even if you are really enjoying yourself!)? For me, it’s definitely cooking my own meals. Let me preface this post by saying I failed miserably after this morning’s post with making more of an effort to cook at home. That said, we did have a really fun day. We got a bunch more plants for out on our balcony and did a little more thrifin’. I don’t think that’s actually a verb but in my world, it should be. I realized they have books at Goodwill for $1.59 and they had a lot of new looking best sellers. I am going to start stocking up there when I go because I love having books lined up to read. We stopped at a cute little Mexican hole-in-the-wall after a few hours of errands, and had a nice meal sitting outside. Though the day was overcast, it was still pretty nice out and sitting outdoors to eat was ideal. We got the standard chips and salsa to start, with a side of guac. The chips were still warm and delicious. The salsa was a little thinner than I like it, but the flavor was awesome. And the guac was just perfect. I perused the menu and was happy to see they had vegetable tortilla soup. I’ve only ever seen chicken tortilla soup on a menu so when it said veggie soup, I got excited and decided to order it along with a salad. It did not disappoint! The flavor of the broth was sooo good, and there were peppers, onions, and other veggies in the soup. Also, a little bit of cheese and fresh cilantro on top. yum. The salad I got with it was pretty good too. It had grilled shrimp, hearts of palm, baby corn, red cabbage, lettuce, and tomato. I got the dressing on the side, but actually ended up pouring the rest of the salsa over the salad which was perfect. The pieces of tomato in the salad were huge, and two of them were a little on the soft side. I ended up just putting them on the rim of the plate and not eating them, but the rest of the salad was awesome. The grilled shrimp were super flavorful and delicious, and I definitely would not have complained if there were more of them! I’ll be back tomorrow – hope your weekends are going fabulously! PS: I’ve finally sort of gotten my head around Twitter and have started tweeting when I put up a new post. If you’re on there, follow me @bethsjourneytt!